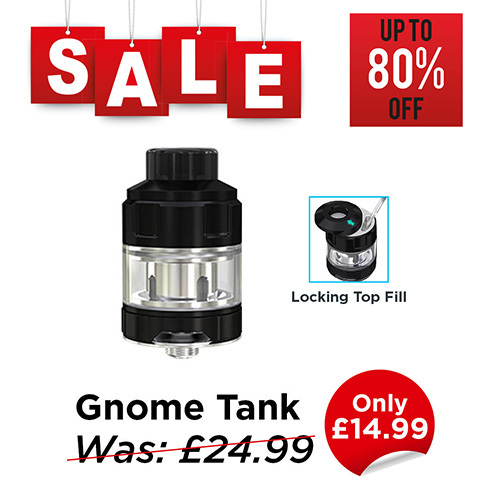 The WISMEC Gnome Evo tank is a stylish and high quality sub-ohm atomiser tank offering fantastic flavour and excellent vapour production. Simply remove teh resin drip tip and slide the top cap to the side to reveal the filling port. Pour E-Liquid into the tank. Close the Top Cap by sliding back into place and lock by replacing the drip tip. Allow 5-10 minutes for e-liquid to saturate the wicking material. You’re ready to vape. Once the tank is empty of e-liquid, unscrew the bottom section. Remove the old coil and dispose of it. Replace with a new coil, dripping some e-liquid onto the exposed wicking material to prime the coil. Screw the tank back together and fill as above. Enjoy your WISMEC Gnome tank!